Behold!! !Noasaurus' skeletal reconstruction!! !I used many other ceratosaur bits and parts, and drew heavily from Masiakasaurus. This is an educated guess of what Noasaurus would look like, as we know very little of Noasaurus. But based on 4 bones, I did this, using the scale and so on, and comparing it to Masiakasaurus, which is thought to be most similar to Noasaurus. The hip is from Ligabueino, another "noasaurid". Se habia dicho que el Noasaurus era más bien un Abelisaurido, que sabes de esto? Es un abelisaurido, pero viene de una rama de abelisauridos peque~nos basales. Como el Masiakasaurus, Velocisaurus, y otros. Nice when I first started drawing I would always draw things in a x-ray form. Lol, not me, altough it makes your dinosaurs 10 times more accurate. 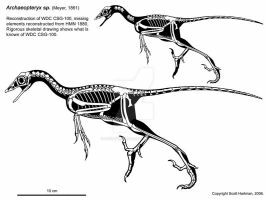 But most of my dinos are based on skeletals that other people made. But I made this Noasaurus on my own right.